Thanksgiving is right around the corner, and thank goodness...I cannot wait to re-create this dish for my family! It was absolutely amazing! This is what a true (vegetarian) stuffing should be: moist and chewy seasoned bread cubes, apples, pecans, sage, and veggie sausage. And how unbelievably easy to make this was! Just mix all the ingredients together, pop into the oven, and you're done! As you can see, I made this without the squash: I couldn't find pattypan squash anywhere this time of year, and frankly, I knew I wouldn't be eating it anyway. That being said, you will have to vary the cooking time and moisture for this recipe. But hey, instead of baking for an hour, this is ready in about 30 minutes. You will have to increase the amount of vegetable stock that's added to moisten everything, but it's especially important to moisten all of the bread cubes (I used Mrs. Cubbisons Herb Seasoned Cube Stuffing, which is vegetarian). 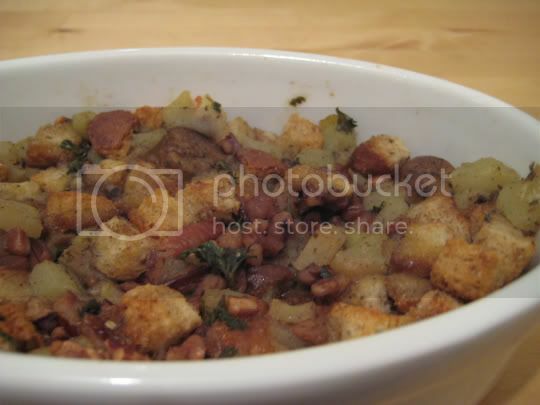 For a more dressing-like stuffing (softer with less texture), I would almost suggest doubling the stock amount. For what you can see in the pic, I just used an extra couple of tablespoons. The bread cubes were soft and moist, but they still retained their shape and held up to the rest of the ingredients. The fresh, herby flavors of parsely and (my favorite spice) sage gave that unmistakable fall flavor. The Granny Smith apple actually was very tart, and the sweetness did not come out during baking as I expected, but it was still a nice addition. And the veggie sausage (I used Morningstar Farms Veggie Sausage Links), well that was just the icing on the cake for us veggies. Make again? I can't wait for Thanksgiving!!! !